We were a bit wrong with our conclusions. We believed that the shutdown could lead to a weaker US dollar. In fact, this was due to information from the wallstreet journal. They reported that the Fed is considering the possibility of early termination of the quantitative tightening program. If the US dollar weakened due to the government’s stopping, it would not be for long time. And if tomorrow during the FOMC minutes or the press conference of the Fed, we will hear confirmation of the information from the source, then the weakening of the dollar may be delayed. The US Federal Reserve has already announced that it is possible not to raise the interest rate in 2019, read that it will not be raised. But if liquidity is no longer withdrawn from the system, then in the long run it is worth to forget about the growth of the US dollar. It is noteworthy that now the market will wait for these statements. The Fed can confirm or refuse this information. And the price will respond accordingly. If the Fed really stops the monetary tightening program ahead of time, there will be a decline in the US dollar. If refuted, we will see a rise in the US dollar. 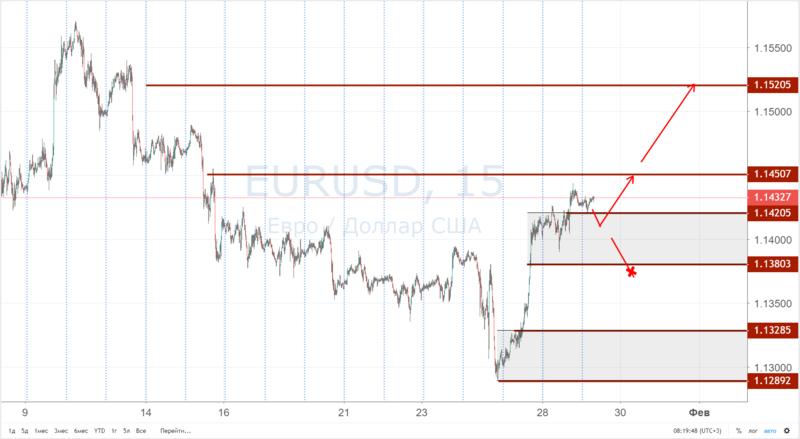 Today, we don’t wait for special movements, of course, if there are no new stuffing, but from a technical point of view, the EURUSD growth is in priority. There is a support zone of 1.1420-1.1380, from where you can look at purchases with a target of 1.1450 and maybe even 1.1520. The last goal will be seen only with the expected fundamental background. Well, the appearance of prices below 1.1380 will tell us that there is at least no trend structure in the market yet. Today, the Parliament of England again votes on the Brexit deal. Recall that the previous terms of the transaction were not accepted, but since then the EU has announced that it can make concessions. Are there any positive notes for England in the new version of the Brexit deal or not, and whether it will be agreed, we hope that we will find out today. From the point of view of technology, we are in the area of ​​1.3140-1.3215, where there is a lot of volume, which can be anything. It is better to see a positive, then we will see a breakdown of resistance, and on a pullback, we should count on continued growth to the level of 1.3350. However, it is worth fearing a false breakdown, so that at the time of the rollback, we closely monitor the manifestation of buyers' initiative. Well, if we see a negative, then it makes sense to talk about sales only after the breakdown of 1.3015.